On Sunday mornings, the Rev. Alison Buttrick Patton is not to be found at a church altar. Instead, she presides from the bimah in the sanctuary of Temple Israel. From that podium, she leads between 120 and 180 congregants of Saugatuck Congregational Church in worship each week. The Coleytown Road synagogue is a temporary home for the church, but not a makeshift one. Members pray, sing hymns, listen to sermons by their pastor and greet each other with hugs and handshakes -- just as they did a year ago in their historic sanctuary on Post Road East. There are light-hearted moments, too. The congregants burst into laughter when Randy Christophersen, the church's mission board chairman, took to the bimah wearing a hat topped with a toy turkey to discuss the church's Thanksgiving feast. But the cause of the congregation's relocation to the synagogue is not overlooked, especially not during its service this past Sunday. "Sisters and brothers in Christ, a year ago on this Sunday before Thanksgiving, Saugatuck Church suffered a debilitating fire that left this faithful community displaced and utterly upended," Patton told the congregation. "One year later, Saugatuck Church remains a church without walls. Together, we are worshipping, working, learning, serving, singing, inviting, growing, blessing all over town." The fire that ravaged Saugatuck Congregational Church's house of worship at the edge of the town center at 245 Post Road East last year ranks as one of the largest fires in Westport during the last decade and probably the most traumatic event for the church's membership. The extensive damage from the fire left the church unusable, rendering a congregation of about 400 homeless. But the blaze has not shattered the spirit of the church community. To the contrary, in the year since the fire, Saugatuck Congregational's clergy and congregants say they have grown closer, both to each other and to members of other religious congregations in town, who have tapped into the town's ecumenical tradition to help the church regroup. Bolstered by that community support, the 180-year-old church is poised to usher in a new era in its history -- one anchored by a restored building and driven by the ambition to serve its members and a wider community as a forward-looking and contemporary-thinking religious congregation. Westport firefighters responded to an automatic alarm at the church about 10 p.m. on Sunday, Nov. 20, 2011. When they arrived, smoke was coming from the rear section of the church complex, which housed a nursery school, offices and meeting rooms. The church was empty, but the quick progression of the fire impelled Assistant Fire Chief Larry Conklin to quickly call in out-of-town reinforcements to help contain the blaze. "As soon as I looked up, I could see the two eaves of the office building and choir area, and smoke was just puffing out of both sides," he said. "Seeing that, right from the get-go, I called our dispatch to fill out the assignment for a structure fire and requested Norwalk's ladder truck." In addition to Norwalk, four other fire departments dispatched crews to the roaring blaze. The six departments -- Westport, Norwalk, Fairfield, Weston, Wilton and Nichols (part of Trumbull) -- together would end up deploying about 70 firefighters to battle the fire. "It was unreal; it was painful to see," said John Walsh, chairman of Saugatuck Congregational's board of trustees. "I got here shortly after the Fire Department arrived to see smoke and flames shooting out of the building. It was scary." The fire refused to be extinguished quickly. As he spotted sagging in the roof of the church's rear, Conklin ordered an evacuation of firefighters from the building's interior. Minutes later, a large section of the roof collapsed. As the fire raged, fire officials grew increasingly concerned that the church would not survive. "I totally expected when I pulled up and looked at the fire conditions and looked at all the smoke coming out of all the windows, coming out of the sanctuary, I thought for sure it was going to burn the ground," said Westport Fire Chief Andrew Kingsbury. "I didn't think we were going to put it out." Crucially, the fire did not seriously penetrate the church's historic sanctuary, which was built in the early 1830s. Teaming with their Fairfield counterparts, Westport firefighters limited the fire's spread to a couple of rafter bays in the sanctuary and prevented it from reaching the landmark steeple. A pair of firewalls in the rear section of the church also helped to contain the blaze. After several hours, firefighters finally knocked down most of the flames. The damage wrought by the blaze was apparent. In addition to claiming a large chunk of the rear roof, it decimated most of the back section of the church. But the oldest parts of the church survived. The sun rose the next morning to reveal an intact sanctuary and a white steeple still standing tall against the late autumn sky. Saugatuck Congregational's members could not dwell long on the decimation of their church; they were still determined to host their annual Thanksgiving community feast three days later. Hours after firefighters extinguished the blaze, the church's leaders had already found an alternative venue for the feast, a Westport tradition for the holiday. When the Rev. John Branson, then-rector of Christ & Holy Trinity Episcopal Church, arrived at the church the next morning to survey fire damage at the nearby house of worship, he offered his congregation's Great Hall as an alternate venue -- where it again was scheduled to take place this year. Last year's Thanksgiving feast, as well as Saugatuck Congregational's annual Christmas feast, drew volunteers from several religious congregations in town, a sign of robust local support for the church that emerged quickly after the blaze. "They allowed us to turn a Saugatuck event into a community event," said Christophersen, who also serves as the church's feast committee chairman. "The spirit has been so uplifted. It's like there's been a new light brought to the whole feast." Within a month of the fire, the church also found its current Sunday worship space -- an idea proposed by Temple Israel's leaders. The shared house of worship cemented a long-standing relationship between the two congregations. When Temple Israel was founded in 1948, Saugatuck Congregational served as one of its initial worship venues before the temple's building was erected a decade later. "We love having them here," said Temple Israel's Rabbi Robert Orkand. "One of the things that I value very much about the time I've been here is the close relationships that the religious institutions and clergy have with each other. It doesn't surprise me at all that we would help each other in a time of emergency." Despite their dislocation, many Saugatuck Congregational members say they enjoy worshipping in their new venue. "It did not feel unusual at all," said Marion Leaman. "I grew up in Westport and Westport is a town with many Jewish people and many Christian people, and there's been a very good community between the individual people of the different religions, between the religious congregations and between the clergy people." Leaman, 44, was baptized and confirmed at Saugatuck Congregational Church. Earlier this year, her 14-year-old twin children were confirmed at Temple Israel. "It was an interesting experience for them to be confirmed on the bimah, where their friends had just been bar and bat mizvahed a year-and-a-half before," Leaman added. "That was a positive and different experience for us." During the last year, Saugatuck Congregational has also relied on Greens Farms Congregational Church, which has hosted memorial services and weddings for Saugatuck members. The two congregations share a lineage: 36 Greens Farms Church members left to form Saugatuck Congregational in 1832. Both houses of worship belong to the United Church of Christ, a mainline Protestant denomination, and they have held joint Sunday services each summer at Compo Beach for more than 40 years. "The two congregations have enjoyed a wonderful relationship before the tragedy, and those bonds have only been strengthened during this time of crisis," said the Rev. Jeffrey Rider, Greens Farms Church's senior minister. "I can only anticipate that those bonds are going to get stronger as Saugatuck lifts off and the new church takes hold." A number of Greens Farms congregants, along with members of Temple Israel, Christ & Holy Trinity and the Church of the Assumption, volunteered at Saugatuck Congregational's Thanksgiving feast this year. "We're sort of like neighbors," said the Rev. Bennett Brockman, the interim rector of Christ & Holy Trinity. "There's a long history of cooperation and mutual regard and that's certainly continuing. It's like being in a fraternity in college -- you never forget the relationships that are built." Patton, 42, is one of the newest members of that "fraternity." She arrived at Saugatuck Congregational in May from First Church Simsbury in Simsbury, where she had served as an associate minister. She began interviewing for the Saugatuck Congregational minister's post a few months before the fire. When she was called back a couple of weeks after the blaze, her interest in the position did not waver. "It got clearer to me that this is where we wanted to be," she said. "I'm in a unique position of not having suffered the loss that my congregation suffered. So I empathize with that loss, but I get to come in on the upswing when the congregation is dusting off their hands and saying, `What do we do next?' That's really fun and important meaningful work." Patton also described the fire's aftermath as a catalyst for introspection within the congregation. "It's launched us into this next season where we get to ask `Who are we? What's important about who we are, what matters to us, who do we want to be as a community, what does it mean to be a church without walls?' " she said. "That's a question that we've asked repeatedly." Saugatuck Congregational leaders hope to re-open the church building at 245 Post Road East by the fall of 2014. They intend to begin the restoration of the church's damaged rear structure in the spring of 2013, assuming their rebuilding plans are approved by the Planning and Zoning Commission. The planned renovation of the church includes the refurbishment of the rooms ruined by the fire and building two new rear entrances, including an entryway for the Saugatuck Nursery School. Where the rear roof collapsed, a new, slightly higher one would be built to allow for third-floor use again. Design plans also call for the creation of a new terrace between the church's garden and Hoskins Hall, a social space underneath the church's sanctuary. The steeple and the sanctuary would not be altered. Church officials acknowledge that the physical recovery of their building has been arduous. While the fire was mostly contained to the rear section of the church, the blaze and voluminous amounts of water needed to extinguish it caused smoke and water damage throughout the church complex. Cleanup and remediation have consumed months. Town and state fire investigators did not determine a cause of the fire. However, they do not suspect that the blaze was set, according to Kingsbury. Saugatuck Congregational leaders are still working with insurers to settle the church's claim. The blaze inflicted damage worth "millions," according to Walsh. Church officials are planning to launch a capital campaign to help finance the restoration, but they have not yet announced a fundraising target. A year later, the fire's wrath is still evident throughout the church's interior. Its nursery school classrooms have been gutted and stripped down to their wooden studs. Sheets of blue tarp encase the interior of the sanctuary, while a web of scaffolding props up the sanctuary's ceiling. The choir room is gone -- the fire scorched it so severely that it had to be torn down. The church exterior looks less ragged. While plywood boards shield some of the windows and blue tarps covers some holes in the sanctuary's roof, the church's facade on Post Road East looks almost identical to its appearance a year ago. On sunny days, the church's white steeple and columned front entrance still gleam. 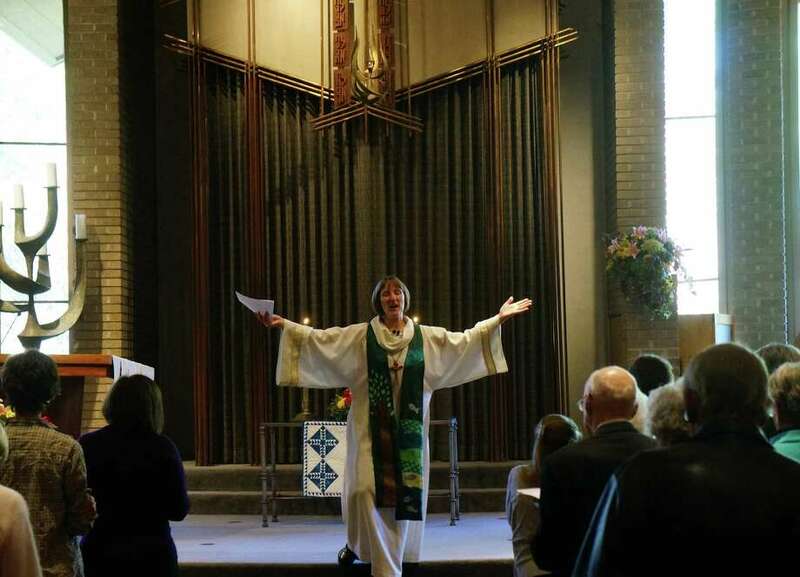 Despite their prolonged absence from their worship space, Saugatuck Congregational's leaders have sought to maintain congregants' connection to the church's home. The church held a Sunday service Sept. 9 and its All Hallows' Fest on Oct. 21 on the front lawn of its campus. Patton, her husband and two sons are already settled on the church grounds; they live in the parsonage next to the main church building. Until they return to 245 Post Road East, Saugatuck Congregational members will continue to meet for Sunday services at Temple Israel. Patton and Orkand are now discussing the possibility of starting joint educational sessions for their congregants to learn more about both Judaism and Christianity. "It's been a real gift to be with the church at this point in time," Patton said. "We are alive and well and making a difference in Westport. We don't have to wait until we're back in a particular building to worship, support each other, impact our community and grow. All of those things can happen right now."